A majestic Moose wanders by a lake in the pine forest on this nature inspired Moose At Dusk Oblong Pendant Light. 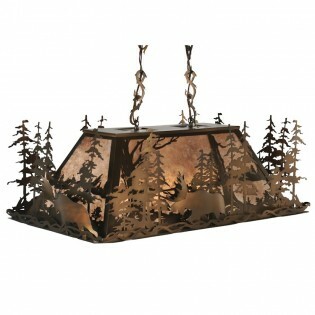 Offering a unique three dimensional effect, Antique Copper finished steel pine tree silhouettes are actually standing on the skirt perimeter as if they are growing out of the fixture. A majestic Moose wanders by a lake in the pine forest on this nature inspired Moose At Dusk Oblong Pendant Light. Offering a unique three dimensional effect, Antique Copper finished steel pine tree silhouettes are actually standing on the skirt perimeter as if they are growing out of the fixture. This versatile fixture features stunning Silver mica panels.